There’s just something about a good perfume. It’s not just about smelling good anymore, it’s how the perfume makes you feel. And there’s nothing that makes me feel like I can conquer the world more than a good Chanel. 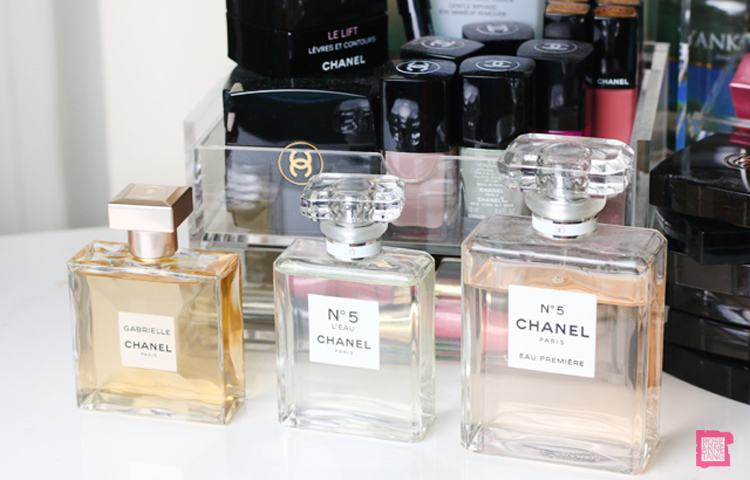 Chanel has many fragrances – Chanel No. 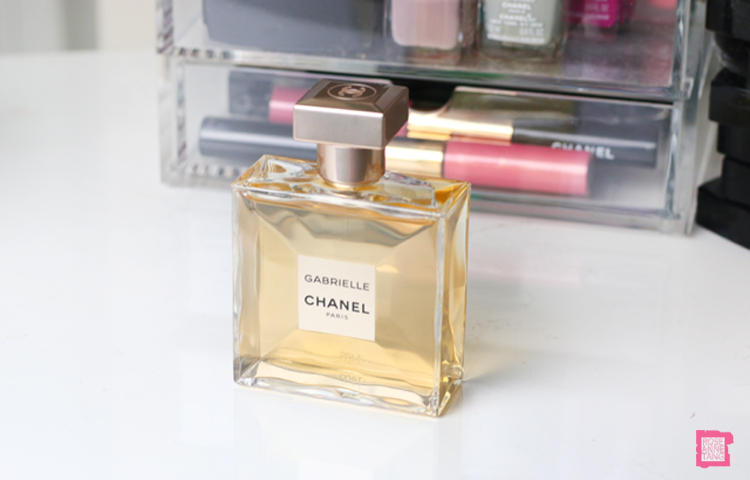 5 is undoubtedly the most classic (I’ve even done a paper on it when I was in university) while Chanel Gabrielle is the newest addition. In this post, I thought I’d compare three – Eau Premiere, Gabrielle and L’Eau – to make your decisions that much easier. Let’s get started! “A solar fragrance created around four points of light from four white flowers: orange blossom, ylang-ylang, jasmine and Grasse tuberose. My take: When I think about who would wear this fragrance – she is young, smart, modern and business savvy. This fragrance is more fresh and upbeat compared to No.5 while still still being able to keep a soft and floral attitude. I feel you can wear this to a hip bar in New York or even during the day. It isn’t heavy, but light and subtle. This perfume captures the essence of the rebellious and free-spirited Gabrielle Chanel who is a woman of so many firsts. When I wear this fragrance, I think of her, and it allows me to feel like I can do anything. The packaging of this perfume is also different. Chanel took special effort to make the straw invisible so that you can concentrate on how geometrically pleasing the bottle is. A modern, fresh and vibrant embodiment of the now and forever scent. Timeless and audacious, simple and sophisticated. N°5 L’EAU is the N°5 of today. Composed by Chanel perfumer Olivier Polge, N°5 L’EAU features dynamic, crisp top notes of Lemon, Mandarin and Orange that reveal lightheartedness and transparency. The emblematic heart of the bouquet unfolds with Rose, Jasmine and a new fraction of Ylang Ylang, more modern than ever. Behind this floral whirlwind lies an unprecedented sense of liveliness: the vibrant echo of Cedar, accompanied by soft and cottony Musk notes. 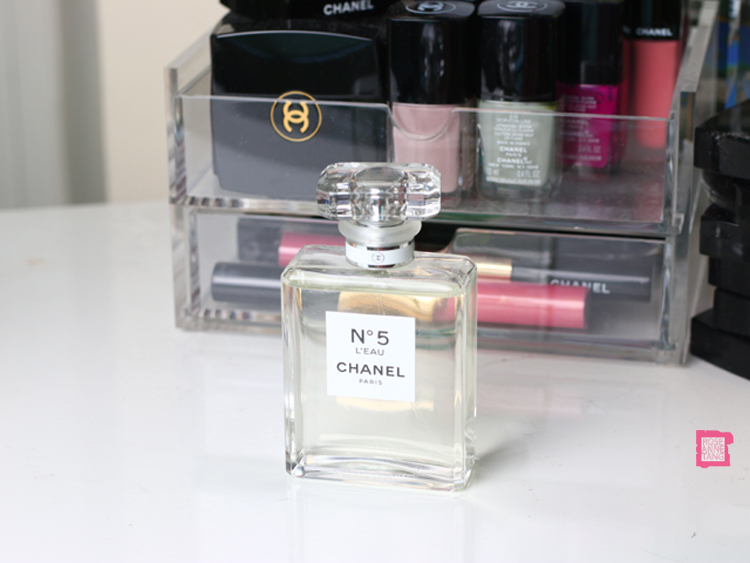 My take: If you’ve ever smelled the classic Chanel No. 5, this is lighter. 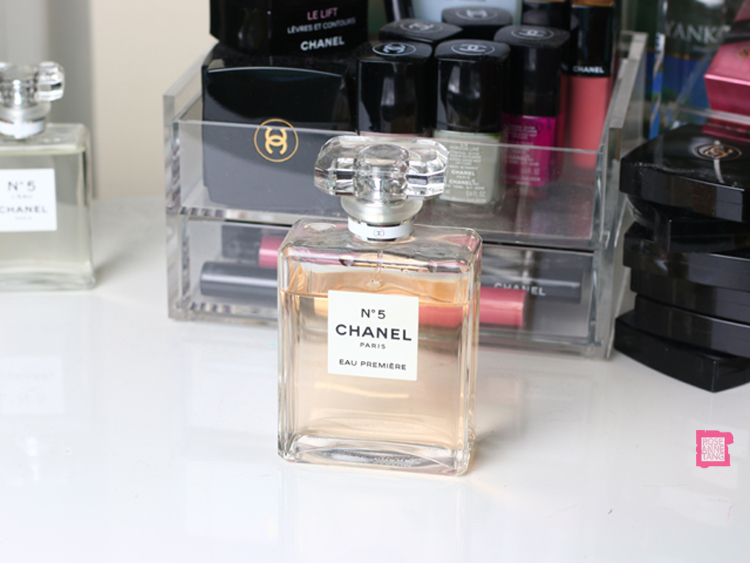 It also still has the powder fresh smell that makes Chanel No. 5 so classic. If Chanel No. 5 had 10 layers to the fragrance, this would only have only 4-5 layers of complexity. It is floral, soft and alluring and doesn’t have the slight acidity that Gabrielle has. A woman who would wear L’Eau would be young, soft and good hearted, happy and filled with light. It has a certain sweetness that Chanel No. 5 lacks and I think this happens to be one of my favourites. Softer than the Gabrielle, L’Eau is more into brunching with friends, taking a stroll in a spring garden full of flowers or wearing pastel and pink – rather than a hip bar scene or urban escapade. My take: This is the heartiest fragrance of my collection and smells the most complex. It’s one of those fragrances that you can take a whiff of and then when you smell off it, it can turn into something else. I love it. I love it because it really does make me feel like a million bucks when I wear it. I wear it for the most important meetings, the most classiest events or when I’m travelling in a cool town like Florence or in France. It was my main fragrance that I wore when I was in France and Switzerland for the first time and it still brings me back there. Although the other two are easy to love, this may be akin to a hard liquer that takes time to get accustomed to but it can be easily “you” after. It has a soapy, powder fresh smell that reminds you of old money, something your grandmother would have passed to you – but one that is comforting and snuggle worthy. I love spraying this on a scarf when it’s cold out, wrapping it all over me. That doesn’t happen much when I’m in Singapore so I tend to use the other two more when it’s hot out. Hope you enjoyed this fightoff! and of course the new blog layout 🙂 What’s your favourite fragrance of the moment? Review: Chanel Rouge Allure Lipstick in Super for Hot Pink Lips!